Abel began in 1980 as an aerospace machine shop, and since then it has rapidly built its reputation on quality. With close to 30 years of experience building some of the finest fly fishing tackle available on the market, you know when you see a product bearing the Abel name, its going to be top quality. Camarillo, California to be precise. All reels are 100% handcrafted here by highly skilled technicians and artists using the finest materials. Abel SD Reels: SD stands for �Sealed Drag;� this is for anglers searching for the ultimate trout fishing reel. The smooth and fully sealed drag can be counted on in all fishing situations and it prides itself on being highly durable and versatile. Abel Super Series Reels: Super Series Reels feature a high quality cork drag system and Teflon sealed bearings. From light trout to big game, this series of reels has proven its worth over the last 20 years of fishing excellence. Abel Spey Reel: Simply Classic. 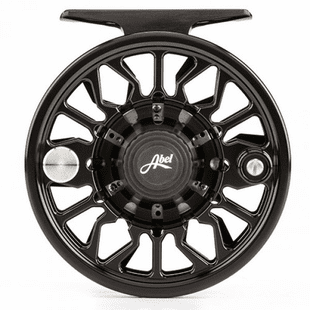 This is the perfect reel for the avid spey fisherman. Made with high-grade aerospace aluminum and stainless steal internals, this click pawl reel is one tough hombre. Once you hear this baby sing, you wont want to fish for steelhead with any other reel. I sure didn't! Another reason why we love supporting Abel is that for every reel sold, they contribute 10% of the sale price to conservation efforts to protect the fish we love and the environments they inhabit.